Lake Buena Vista Factory Stores is celebrating two decades of great deals, and we have a $50 gift certificate giveaway for you to shop! The outlet center is hosting the Lake Buena Vista Factory Stores’ Deals for Two Decades 20th Anniversary Celebration on Saturday, October 22, from 11am to 3pm with fun free activities for every age. Join the celebration featuring more than $8,000 in prize and gift card giveaways at 11:30am, 12:30pm, 1:30pm and 2:30pm (must be present to win), plus a bounce house, DJ entertainer, strolling magician, face painters, balloon sculptor, stilt walker juggler, 20 cent hot dogs, drinks and more. Many stores are pulling out the stops with $20 gift card giveaways, 20% off deals, and special store activities. Families can also have their picture taken with Sunnie, the Sunshine Foundation’s mascot. All proceeds go toward the Sunshine Foundation, the original wish-granting organization, a charity founded in 1976 bringing unimaginable joy to children living with chronic life-long conditions. At the end of the month, Lake Buena Vista Factory Stores will host a frightfully fun and safe “trick or treating” event on Halloween, Monday, October 31, from 1-9pm. Participating stores will pass out treats to the children while families shop. Everyone is invited to join in the fun, and children are welcome to dress in costume. At the Lake Buena Vista Factory Stores, shopping is hassle-free and you can find can find factory-direct premium quality merchandise at savings up to 75% off (and sometimes more). There’s free store front parking, too, which makes getting in and out easy. Sound good? Well, we want to make it even better. 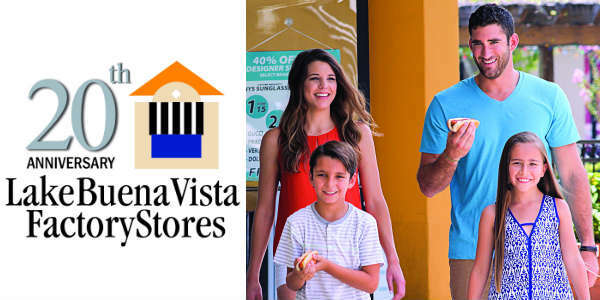 CitySurfing Orlando is happy to be partnering with Lake Buena Vista Factory Stores to give you a chance to win a $50 gift certificate to shop at the outlet center. That’s $50 for you to spend at stores like Lindt Chocolate, at Express Factory Outlet, U.S. Polo Assn., Nike, OshKosh B’Gosh, Tommy Hilfiger Stores, plus other well-known outlets including G by GUESS, Justice, Carter’s, Crocs, Calvin Klein, Levi’s®, Aeropostale, Converse, Fossil, Rack Room Shoes, and many more. Simply use the Rafflecopter form below to enter. You can even earn extra entries by doing things like tweeting about this contest. Deadline to enter is 11:59pm (ET) on Sunday, October 16, 2016. The winner will be chosen at random from all valid entries and will be notified by email. That winner must pick up the gift certificate in person at the Lake Buena Vista Factory Stores mall office by November 17, 2016, it will not be mailed. There may be other sites holding their own giveaways, but you can only win once during 2016, so no duplicate wins at multiple blogger sites. Those participating bloggers may not enter this contest either. Even if you don’t win, you can get in on the savings by downloading a coupon from the Center’s website, then bringing it to Travelpro at the Lake Buena Vista Factory Stores to receive a coupon booklet valued up to $400 in savings. Savvy discount shoppers can learn about these discounts, as well as specific stores and their hours by following the center on Facebook, Twitter, and Pinterest, as well as visiting lbvfs.com. Lake Buena Vista Factory Stores is located just one mile from Walt Disney World at 15657 S. Apopka Vineland Road (State Road 535), Orlando, FL 32821-6316, and two miles south of I-4, Exit 68. Stores are open Monday-Saturday, 10am-9pm, and 10am-7pm on Sunday. Disclaimer: Lake Buena Vista Factory Stores is sponsoring this giveaway via CitySurfing Orlando. Yes, I’ve shopped there. There is a cute independent coffee shop there.